NOTE: This is the first of a four-part series on the central subject of God’s sovereignty in Job’s suffering. Pr Charles shares, ‘The proper understanding of the subject has a direct impact on our relationship with GOD. For it is evidently not about just asking and to be receiving, but also goes beyond this materialistic and earthly level, reaching into the Spiritual realm of our soul and our afterlife in eternity. And as such to be honouring GOD ALMIGHTY in such holy reverence in the very fear of the HOLY GOD! In the expansion of the above question, which answer having been already confirmed over the centuries in the affirmative by the Church and Christianity at large, with a thumping big Yes…GOD DID IT! GOD had provoked Satan to attack Job! Period, end of story…A huge charge though, coming from such frail humanity in this indictment brought upon GOD ALMIGHTY, our very Creator and of everything, in such a nonchalant, carefree manner by early Christianity! Yet this strange outcry such arising from Christendom from the past, to me, was and still is simply being atrociously blasphemous and preposterous indeed to say the least. Therefore, as I come into understanding this as such and in the very Biblical Truth of the matter evident now, just recently having surfaced in my study of these Scriptures concerned here by the Grace of GOD, I would like to share this insight with you my fellow Believers in CHRIST JESUS. This being also paramount in its importance, because we must right this terrible wrong that our past has mistakenly and that too in the gall of it all, brought this upon our all Just and all Merciful GOD. Amen. PRAISE GOD. The statue of Job which sits in the Crystal Cathedral grounds. GOD Shows Off Job To Satan? And the reason for this past yet mistaken affirmation as given most of the time, was that GOD wanted to show off Job, parade Job to the great dragon, of how righteous a person Job really was at any material time. That was it! This I understand was to mean in the good times, in the challenging bad times that may come to Job, and even so through any evil times that may also stricken him. And so, the expectation of heaven, GOD in this, was that through all of this nothing would turn Job away from being totally loyal and steadfast to HIM. For as in this, GOD had evidently declared in the Holy Scriptures, and this was and is for us down the generations in such multiplicity, to also know this specifically, that Job feared GOD, and escheweth evil (i.e. he shunned evil by his own willful choice!). So, as I see this in the Scriptures, it is really and truly remarkable that GOD had even declared this as such about Job, that Job had evidently feared GOD through and through. And this by his own wilful choice and this too not for anything else of gain, of increase or profit, except when in his doing appeasement for any wrong doings, as he often offered the ‘burnt offerings’ to GOD. And this was not that due to any committed sins, but that as of his family, his sons against GOD. For regarding himself in this, he was even evidently declared also by GOD, to being a perfect (faultless) and upright (righteous) man, who feared GOD and there is none like him on the earth (living at that time in his area). And Feared GOD, essentially means, to be having total holy reverence for GOD, loving GOD, worshiping GOD and this only as for GOD, and none for any other. Amen. Holding GOD above everything else, way above even of life, limb and of every possession. And as such in this to also totally eschewed evil. Not even an iota, jot or tittle to be given in, to any evil. It is in this state only, that one can be perceived and established as to have feared GOD. And so in this, Job offered the ‘burnt offerings’ regularly to GOD, standing in the gap for his sons, for their appeasement, their atonement as such in the very likelihood of them having sinned against GOD, even as such any of them may have cursed GOD (i.e. blessed GOD in a negative way) in their hearts (meaning in thought, which is just as evil in GOD’S Sight). Therefore, it is clearly evident through the Holy Scriptures, being the very precious and Holy Word of GOD, this is paramount in such significance in the Job Account. That Job first and foremost and above everything else, was established as one who feared GOD, and eschewed evil. And as mentioned this was not even for the blessings to be gained, which normally most clamour for. Meaning for any increased prosperity, better health perhaps, or for any other usual gain that many of us Christians continuously look towards GOD for, in our daily prayers asking, yet many having little or no fear, no holy reverence at all for GOD! Therefore in this, through the overall context of the Job Scriptures, it can be reliably concluded also that Job clearly had not been coerced into this. That is evangelized by anyone specifically into being so, to fear GOD and eschewed evil. Yet he was indeed certainly fortunate to have come somehow through some means as I see this, by GOD’S Sovereign Providence in his life for sure, gifted to knowing about GOD, the Living GOD, the ONE GOD that which being well known and worshiped solely by the Jews at that Biblical time. If this, coming to know of the Living GOD was not as such, Job would not have even understood anything about what ‘burnt offering’ really does for the one offering it, whether for self or for another on their behalf, to GOD. For Job was doing this ‘burnt offering’, clearly conducting himself also, even as being a Priest, such as the ‘Levite (Jew) Priests’ who do this regularly for the people of Israel. And so, Job as Priest in this of his own household, therefore knew most evidently of the holy significance in the ‘burnt offering’, just as what is described of it in ‘The Third Book of Moses called Leviticus’ – Chapter 1:1-17 refers accordingly regarding the ‘burnt offerings’. For at that Biblical time, this was practically unheard of among the Gentiles, meaning the heathens who were all Pagans, worshiping idols to being man-made gods, these becoming in their reality, their deities. Besides, Job was also at the time very well off, meaning a wealthy and healthy man indeed, of a great household. Nothing supposedly lacking or needed by him at the time, and yet he feared GOD, and eschewed evil. That is the wonder in Job, which may have persuaded GOD to declare in HIS written Word, that there is none like him on the earth – which as we learn was indeed referencing, in the East! Yes, Job was evidently a Gentile, a man of the East being from the land of Uz, and declared by GOD as being the greatest of all the men of the East! Some say this land of Uz could be possibly not too far from the Sea of Galilee. Others place this in the north Arabian desert about 200 miles east of Petra (located now in Jordan, the Hashemite Kingdom). And so, it was purely on his own, he being a Gentile that he came to know about the Living GOD, through some way, by some means, perhaps in this somewhat proximity of living near Israel at the time. And as such perhaps through some trading activities with Jewish traders from Israel, and therefore establishing in this on his own volition, he feared GOD, and eschewed evil. Yet, it has been put forward, “GOD had provoked Satan into attacking Job!” Despite this exemplary relationship that the Gentile Job had with GOD, voluntarily on his part from the very beginning, a huge step forward for any Gentile at any time. And perhaps because of this he was in turn specially blessed by GOD as well, despite of not being a Jew himself, in his ongoing prosperity in every aspect of his life. …And the Lord sayd vnto Satan, Hast thou considered my seruant Iob, that there is none like him in the earth? a perfect and an vpright man, one that feareth God, and escheweth euill? 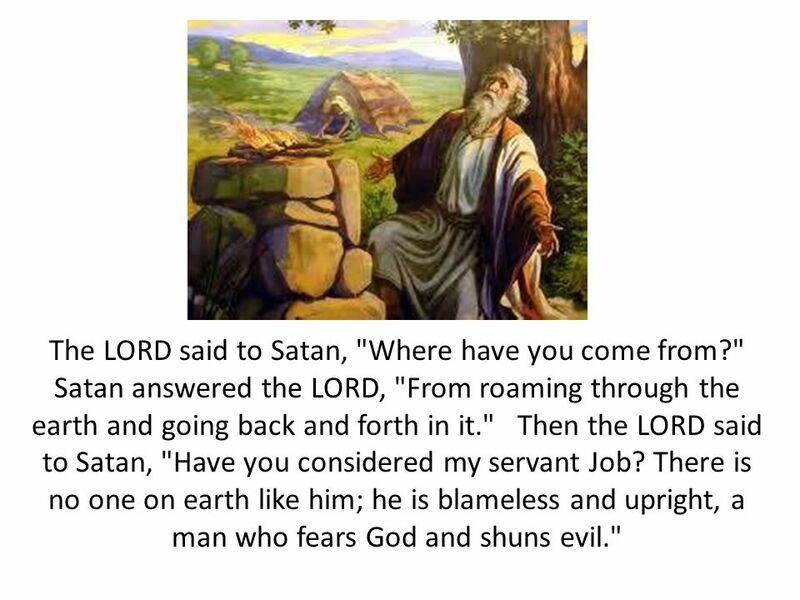 This is the commonly known given reason based on this Scripture alone, which provides the answer and the very conclusion to the above question, “Did GOD Provoke Satan To Attack Job?” – Yes, GOD DID IT! However, and yet most appallingly or glaringly, Satan as scripturally evident also, knew quite a lot about this Job, even beforehand! Yes, Satan did indeed. Not because he was clairvoyant or had any special powers in this, but because he had certainly been observing Job for quite a while actually. This is as the very next following three 9-11 Scriptures, gives it up for us, providing such exacting evidences of this, which unfolds accordingly together with Job 1:8. This becoming evident, as Satan going in his regular reporting as scheduled to GOD from time to time as obviously required of him. For Satan, going from down here in the earth, to the very Presence of GOD, taking note not the ‘Physical-Spiritual’ Presence of GOD, but nevertheless, where GOD’s Presence was made evident for his reporting and for any verbal exchanges necessary to be between him and GOD and GOD with him. That was the appointed place for these such heavenly meetings at the time, as I gather this from the Scriptures. 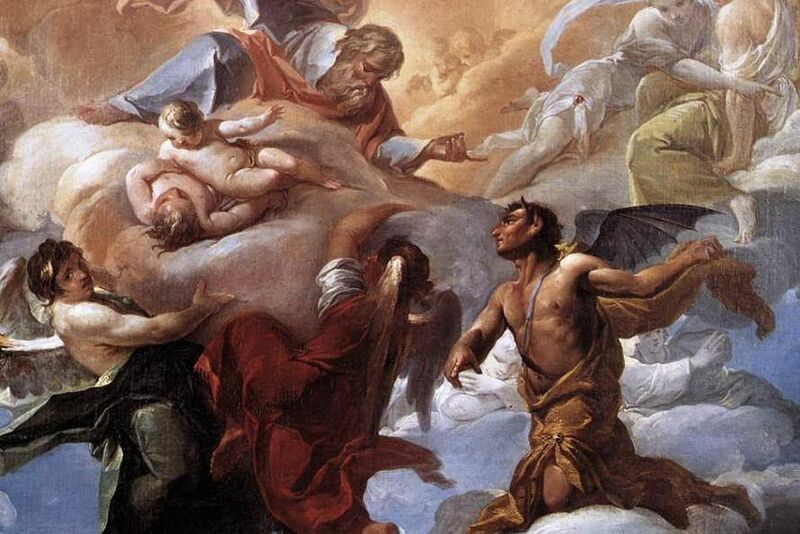 And this too, as Satan comes among them, meaning together with that of the sons of GOD (here referencing, the celestial spirit beings in heaven, perhaps of the remaining angels) as well, as they had to do the same in such reporting to GOD regularly. There was a day, during one such reporting session, that when GOD as I see this most clearly and most evidently now, had begun questioning Satan as confirmed in Job 1:7-8 Scriptures accordingly. This clearly incorporating into this Sovereign GOD’S Line of Questioning of Satan, the very Job 1:8 Scripture, which is in such contention here in this Message. Satan Confesses to GOD, That He Knows a Lot About Job! Satan then answers accordingly to GOD’S Line of Questioning him, in owning up, ‘confessing’ his guilt in this to GOD – that he knows a lot about Job! For Satan evidently then informs GOD ALMIGHTY in such truth, for I perceive there is no way any one can lie in the very Presence of GOD or of GOD’Ss Questioning at any time anywhere and as such in this, Satan confesses actually knowing of this Job. This Job, which GOD has brought up in specific mention as in the Job 1:8 Scripture. Satan owns up to GOD, WHO already knows all about this matter, being Omniscient of course, of all Satan’ observed knowledge regarding Job. And yet GOD Questions Satan not in any ignorance but certainly for our benefit, so that we too can come to know this in HIS written Word. And as such, Satan has also concluded in this, of the GOD Hedge of Protection having been set up by GOD over Job, all around his household and all around Job’s possessions!! And from this ‘confessing’ or owning up his guilt, it can be understood also accordingly, that Satan had indeed already attempted attacking Job to becoming one of his fallen victims. That is to be sinning through some temptation as brought to him by Satan, and in this to evilly expect Job to turn away then from GOD. 6Now there was a day, when the sons of God came to present themselues before the Lord, and Satan came also among them. 7And the Lord said vnto Satan, Whence commest thou? Then Satan answered the Lord, and sayde, From going to and fro in the earth, and from walking vp and downe in it. 8And the Lord sayd vnto Satan, Hast thou considered my seruant Iob, that there is none like him in the earth? a perfect and an vpright man, one that feareth God, and escheweth euill? 9Then Satan answered the Lord, and sayd, Doeth Iob feare God for nought? (Actually, this is true indeed. Job feared GOD for nought, but for purely the fear of GOD, and as he eschewed evil. This has already been envisaged as such, and shown earlier above. Yet Satan uses this probing answer-question to GOD’S earlier Question in the 8th Scripture, in his usual manner of strategic deceptive ploys for his own agenda to be played out for his own benefit. But this is indeed the truth -Job feareth GOD for nought, for no gain whatsoever, but in such holy reverence of GOD. Pure and straightforward! And as such this 9-11 Scriptures in which Satan answers GOD to GOD’S First Line of Questioning, completely destroys the mistaken thinking as what was shown earlier as above, in ‘their’ conclusion made regarding the Job 1:8 Scripture. This former conclusion, which had become the very basis of proving and answering the question asked at the very beginning of this Message, as to being absolutely true in the affirmative, when it was completely not so as thought in ‘their’ absurd and erroneous conclusion. And so going by this refreshed new premise made available here, Satan knew of Job, and in fact a lot about him way beforehand, which nullifies the supposedly pointing out by GOD of the supposedly unknown Job to Satan, as ‘they’ interpreted this solely on Job 1:8. I hope you can see already the defectiveness in the charge, that has been most unceremoniously brought up against GOD ALMIGHTY. Amen. PRAISE GOD. 12And the Lord said vnto Satan, Behold, all that hee hath is in thy power, onely vpon himselfe put not foorth thine hand. So Satan went forth from the presence of the Lord. The article is taken from a different dimension of God showing us the he is ultimately in control of everything. Job was a subject of attack of the Satan but he did not lose sight of God’s mercy and Grace. We all face the same situation in our daily lives. It’s either we put our entire trust in him or give in to the manipulation of the devil. Yes, David, some people have not understood the article, but that’s the position the writer is fighting for. Because the writer’s thesis is long, I have made the decision to split it into 4 parts. Job was not a victim of God’s provocation of Satan. Throughout it all, God was in control and He was watching over Job. The great lesson about Job was that he trusted in God and did not lose sight of this and his relationship with God.